A bright Autumnal morning heralded the start of day 2. Time for a stroll around Inverness before catching the12:40 train back to Glasgow. 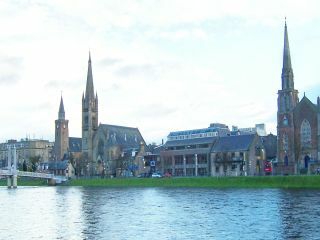 Inverness can trace its origins back to the 4th century but only became a city in 2000. 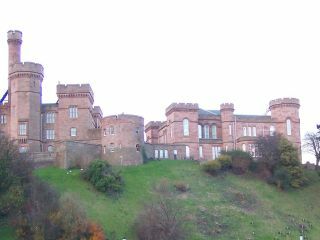 Inverness has a castle sitting atop a hill where a fortress has stood for almost a thousand years, the current castle however dates from 1836. Did I mention the churches? there's dozens of them! I know there are train spotters and beer tickers but if there is such a group as church spotters Inverness is like Clapham Junction and the British Beer Festival rolled into one! There are so many churches they even have a website!! Churches along the river beat that. All this talk of churches leads me to make a confession to you. The best reason to visit Inverness and truth be told the catalyst for this trip lies on the shore of The Moray Firth about 8 miles north east of Inverness. The Anderson, Fortrose is a pub, hotel and restaurant run by a self confessed beer geek / genius Jim Anderson. 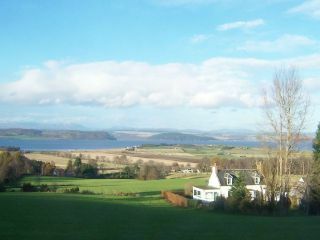 Jim arrived in Fortrose in 2003 with his wife Anne, a chef with an impressive C.V. of her own. All I can say is if you love good food, great beer and first class hospitality then you must add this place to your list of places to visit. We had it on our list but a word of caution to you - don't plan your trip near to Thanksgiving as you may find it closed! It was fast approaching noon so back to the railway station. Our train was to take us to Perth for a connection to Glasgow. The good news was the weather was fine and bright so we would be able to enjoy the wonderful scenery the highland line offers. 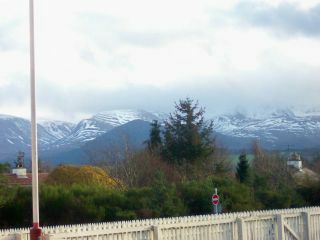 From the views across The Moray Firth to the snow capped Cairngorm mountains the countryside here is beautiful. After our change of train at Perth we arrived back in Glasgow which was to be the location of our overnight stop. Our hotel of choice was the Quality Inn, Gordon Street, Glasgow. This is another classic Scottish railway hotel with an entrance from the concourse of Glasgow Central station. Another monument of Victorian grandeur from an age when rail travel was at the pinnacle of travel. Ok, so another few hours in Glasgow - which of the numerous Good Beer Guide pubs to visit next? We settled on a typical Glasgow tenement pub and then ended in a Glasgow institution. Tennents, Byres Road is in Glasgow's West End. This part of town is renowned for its pubs and restaurants, no surprise as this area is densely populated with students from the nearby University. Tennents is housed in a classic street corner Tenement block and caters for all walks of life. With around twelve real ales on at all times, it is well worth the short bus or subway ride from the city centre. We finished the evening in the Merchants City area of Glasgow. This is a short walk to the east of the main city centre, not far from the impressive town hall. The pub in question is the Babbity Bowster on Blackfriars Street. The 'Bowster' has more of a cafe bar feel to it that must real ale pubs but the beer is well kept and definitely not an afterthought. Remarkably the pub also has a beer garden, although on a damp November night this really wasn't much of a draw! P.S. have a go at the excellent Neeps & Tatties if you are peckish.